1 Why Do You Need Freediving Fins? 2.1 Do You Need an Enclosed Foot Pocket? 2.4 Fin Rails or No Rails? 4 How to Care For Your Freediving Fins? 99% of divers don’t need them and you’ll do fine with regular blades. Before you get mad and say that you’re the 1%, let me clarify. No diver ever complained about having the best fins, but fins are only as good as the diver. Before we cover each fin in detail, let’s first determine why you need quality freediving fins for reaching your optimal bottom time with less effort. The simple answer is to get yourself in position to shoot more fish on a single breath. The complex answer is taking into account your skill level, the environmental condition, the comfort of the fins to increase your dive time, how much efficiency you can get out of fins, and the list goes on. I know a guy who spent a few days with his buddies testing out a bunch of spearfishing fins to see which ones worked the best to try and put to rest the ambiguity of which was the best. They realized quickly that dive times were not substantially increased by carbon fins. An experienced large old man using plastic fins will have a better dive time than a young buck repping new carbons. The diver and his technique trump any technology. 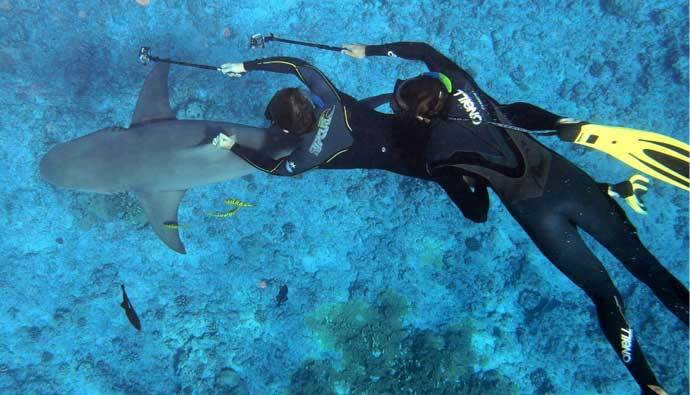 I’ve even seen divers in Asian not even use fins and they were deadly in the depths. The only thing the divers doing the test noticed was that the initial acceleration and the force needed to initiate the dive for the first 10-15 feet showed that the carbons were the quickest. After the diver got past this zone, it didn’t make much difference. Does this mean you should go out and pick up a pair of carbons today? Honestly, if the placebo effect works on you because you bought carbon fins and it increases your dive time, maybe then you should buy them. The reality is that most fins are relatively similar, but costs vary a bunch. Freediving and spearfishing is a dangerous sport. If you need the most expensive gear to feel like your gear will take care of you…OPT FOR THE EXPENSIVE STUFF. If that’s not something that rests on your psyche, then just get a set that’s robust and spend the saved money on more gear or trips to exotic locations to practice. Now that we are clear on how you should view fins, let’s dive into the details regarding the various fin features. Do You Need an Enclosed Foot Pocket? Most foot pockets are universal in that they will trap your foot to help you drive the power from your legs through the tip of the fin in an efficient manner to propel you forward. The main things to look for is the wideness or narrowness of the pocket and the firmness of the rubber used. Remember that most of the off the shelf fins will require space for a fins sock so if you try on a fin barefoot and it fits great…it might be too snug with the sock. When it comes to material softness, it tends to be personal preference. You’d probably be better off with a softer footpad as that seems to be correlated with more comfort and longer dive times. The last thing you want is something super stiff that tires out your ankles and legs making you call the dive early. A good rule of thumb when sizing foot pockets: when trying on the fins, flex your foot to the natural diving position while standing. If your finger can squeeze in the side while flexed, if it feels snug it’s a good fit. Remember, efficiency is key with fins and a solid foot pocket will help you transfer the power from your legs through the tip of the fin. Not all fin blades fit each foot pocket…ALWAYS DOUBLE CHECK before buying. Plastic blades are the cheapest and least efficient style. They are good for you if you’re a newbie because they are fairly robust and most of the time will weather the barrage of abuse you might throw at them. If you’re a recreational diver, instead of going broke on a fancy pair, try plastic for a while, they’ll get the job done and won’t break the bank. You’ll notice with plastic blades that when you bend them and let them go, they are slow to bounce back to their original position…this means a loss of efficiency, which adds up with each kick, tiring you out faster. Fiberglass blades are much more responsive than plastic blades. Their response time after being bent to their original position is fast, which means more efficiency from each kick. This is the most noticeable jump you’ll see between fins. If you have plastic fins and switch out your blades to fiberglass you’ll be pleasantly surprised on the added ease for your dives. Fiberglass fins have less resistance when closer to their original position than carbon does which make them less efficient than carbon. Fiberglass, however, tends to be a bit more durable than carbon fiber for less cost, so keep that in mind…might be worth buying two sets of fiberglass blades for the same price as carbon for nearly the same efficiency. 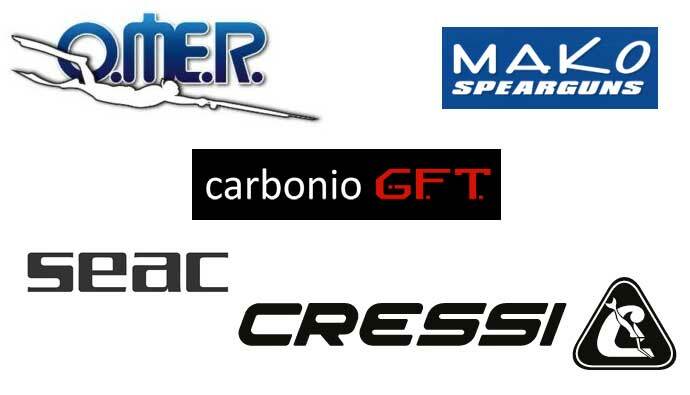 Carbon fiber blades are the Ferraris of the spearfishing world. If you have a pair…you’re the cool kid. They are the most responsive from bent to their original position, which means they are the most efficient in transferring energy per kick. If you slo-mo videos of freedivers you can see super long carbon fiber fins have a sinusoidal shape in the water…this role is great at providing thrust to the diver. Are you going to feel the difference between fiberglass and carbon fiber? Probably not unless you’re a serious freediver. If you’re diving more in high current areas or consistently do deep dives, carbon fiber could make sense, but this is the rarity rather than the norm. 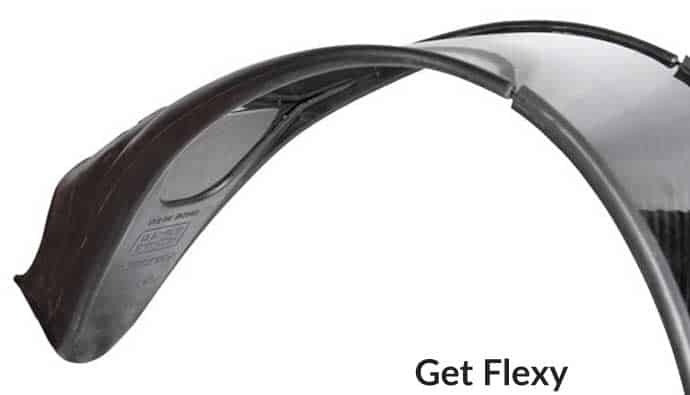 Fin stiffness is heavily dependent from brand to brand and the type of materials being used. Each material is broken down into soft, medium, and hard. Some manufacturers have poor quality control and a soft in one batch of blades might be more firm than another batch. Hopefully, the brands I’ve picked in this list are not in that camp, but just be aware that it could happen. Some spearos recommend opting for a slightly stiffer fin because it helps when you need to get a bit more propulsion, especially when fighting big fish. Therefore, medium to soft is probably the best firmness for most spearos. Diving in current? Use a stiffer blade so you can get more power per kick. Are you a spearo? Use a stiffer blade so you can fight current and fish. Are you a pure freediver and never dive in current? Go for a softer blade depending on how big you are (bigger go a bit stiffer). The deeper you dive the stiffer your blade should be to balance out the lack of buoyancy. Fin Rails or No Rails? There is a group of freedivers who believe that having rails on the edges of the fins channel the water through the center giving you more thrust. You might get a slight advantage, but for most spearos, it most-likely will not be noticeable. Therefore, get them if you want them, but don’t stress about it. Pick comfort over brand. Your feet will thank you. If you’re looking for the most advanced fins on the market, look no further. This company was born out of the aerospace industry and know what it takes to make the best composites. They focus on having a top-notch manufacturing process to make sure your carbon fiber blades will stand the test of time. If you’re looking to spend on quality…this is your brand. Omer is based in Italy and those in the know will tell you that their products are great. I was recently at a spearfishing auction and some of the highest bidding products were OMER spearfishing fins…maybe that means something! Seac is an Italian company who’s been in the arena from 1971. They are constantly investing in research and development, bringing the latest innovations with an Italian touch. They are always striving for strict quality controls. How to Care For Your Freediving Fins? Taking care of your freediving fins is relatively straightforward…but as always, check with the manufacturer for more details. Try not to stand on the fins, especially the tops. The weight could bend or break the delicate material. Don’t leave them in extremely hot or cold areas as the rubber could dry out or freeze degrading the foot pocket. This could also damage the blades. Don’t leave your fins in a hot car because it could deform the materials. You are best off rinsing them with fresh water and drying them. Make sure they aren’t wet if you place them in storage. If you do store them, keep them in a cool dark place. Try not to get tar, gasoline, alcohol, and a myriad of different chemicals on your fins. This could degrade the various materials and shorten the life of the fins. If you do spill something on the fins, try to rinse it off with water. If that doesn’t work, try soap and water. Try to stay away from abrasive and corrosive solvents like alcohol or paint thinner. If you’re new to freediving or spearfishing, stick with either plastic fins or fiberglass fins. Find the most comfortable foot pocket. Soft to a medium firm will suit you for most situations. Do your best not to kick the fins against rocks or the reef to keep them from breaking. Once you find a pair you like, pick up a few more for different diving conditions. Make sure you use fin socks unless you have a custom foot pocket. Clean your fins with water after each dive. Make sure you dry them before storing. Don’t keep your fins in a hot car to prevent deformation. Gara 3000 Long Distance is Cressi’s entry-level long blade fin designed with softer blades, which make the Gara 3000 LD a perfect choice for the beginning diver or those not familiar using long blade fins. The LD version originates from the greatly-appreciated Gara 3000 but the material of the blade is softer than the previous version, what makes them stand out. Thanks to the softer blade less muscle effort is required for kicking so divers can use them for longer, making them perfect to use many hours in a row. The Gara 3000 LD is constructed with durability in mind and long soft plastic blades that can effectively transfer power with minimum effort, which make this fin very comfortable and easy on the legs for the beginner or during long-duration dives. The Gara 3000 LD is extremely comfortable and is a full foot pocket style fin. 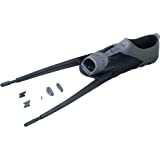 This fin is also constructed using Cressi’s unique three material molding process where different compounds are bonded together to provide flexibility in the foot area and while being able to deliver power thru the blade due to the stiffness that the multi-compound molding process can provide. Can comfortably be worn with or without neoprene socks. The Omer Stingray Full Foot Fins Fixed Blade is characterized by their Thermo-Rubber Foot-Pocket and for the Angle between Foot-Pocket and Blade. The 22 degrees (compared to traditional 15/17 degree). With Traditional Fin Blades an Angle between the Heel of the Foot and the Calf of the Leg remains when the Leg is Extended-to-Kick. This Angle causes a loss of Propulsion. The 22 degree Angled Blade Design accommodates for this Anatomical Characteristic and Ensures Maximum Efficiency throughout the Kicking Cycle. The22-degree angle results in Optimizing the Power of the Push through the Water Relative to Effort. The use of Thermo-Rubber of Two-Different-Stiffness Compounds Increases Comfort over Normal Foot-Pockets. The Non-Vented Blades of the Stingray are produced in a Low-Modular Polypropylene Material. Extending from the Foot Pocket are Side Rails which add Stiffness to the Blade and prevent Water from Spilling” over the Outer Edge of the Blade. The Blade of the Fin is also channeled. The Side Rails and Channels Focus the Movement of Water Down the Surface of the Blade Increasing Power. The Foot Pocket is equipped with a Large Rubber Pull-Tab making Donning-and-Doffing Easier. The Stingray Fin is Black in color and is covered by a 24-month limited warranty. 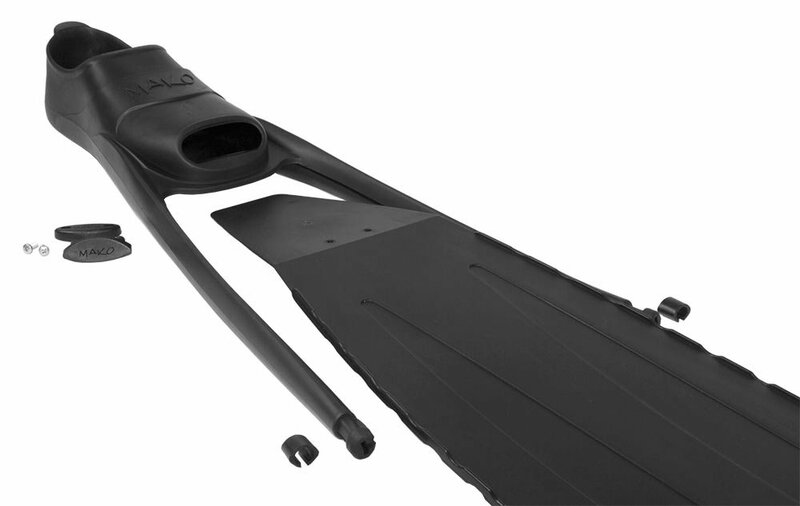 The Seac Motus Fibrex Freediving Fins are dive fins that employ an innovative fiberglass compound, comfortable dual-material foot pockets, and a high-performance design. The SEAC Motus Fibrex Freediving Fins are composed of an innovative fiberglass compound with high-performance characteristics. These interchangeable fin blades come mounted in the SEAC full foot pocket, for a complete freedive fins set. 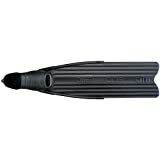 The full foot pocket of these spearfishing fins are constructed in double dual-density materials. The sole and ribbing are hard thermoplastic rubber, with soft thermoplastic rubber for the shoe. This blend optimizes your comfort and performance ratio for cutting through the water. The new Stingray Carbon fins feature carbon fiber blades manufactured using the infusion technology with an innovative double vacuum process. Thanks to this technology the carbon fiber strands are impregnated perfectly in the resin without the risk of forming micro bubble kicks. In addition, the percentage of necessary resin is reduced considerably more than before with a great increase in performance characteristics of the blade. The specific carbon fiber strand used was developed specifically for the manufacture of freediving fins and patented. The underlying result is a very comfortable fin, in part thanks to the thermo-rubber foot-pockets, providing high performance to the diver. The interchangeable blades are available in three degrees of stiffness 20 soft, 25 medium, and 30 hard. Aside from not tiring out the diver’s legs while kicking on the surface for extended periods the Stingray Carbon blades push the diver the most during descents and ascents even in great depths. This foot pocket is available separately for the user to install any standard aftermarket angled or straight blade assemblies. The foot pocket is constructed with the most modern multi compound joining process to deliver a foot pocket that can offer comfort and suppleness around the foot where desired and yet have stiffer compounds under the foot pocket and heel area where power transfer takes place, and the self-adjusting foot pocket expands to be comfortable with or without socks. The FORCE project stems from the desire to incorporate cutting-edge technologies into the production of innovative and increasingly performing fins. 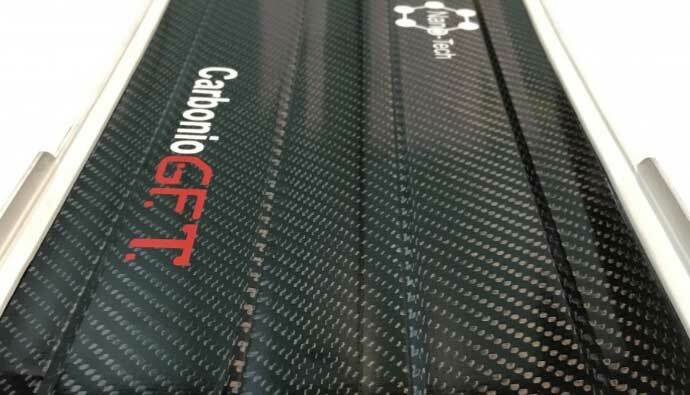 CarbonioGFT, a leading company in the production of fins, has been an exclusive collaboration agreement with the Nano-Tech spa Italian company specialized in the research and development of Nanotechnology for composite materials. The FORCE fins are therefore the first in the world with the help of the nanotechnology offering a whole series of benefits to those who will have the good fortune to be able to use this hi-tech jewel. FORCE first prototypes, CarbonioGFT relied on its official tester, the FEDERICO MANA champion. The project was carried out by Federico and the CarbonioGFT designers engaged for a year and a half and over 20 prototypes before arriving at the final version of the Onda, the first fear that had been prototyped and tested again. The joy of Team CarbonioGFT was top when Federico Mana confirmed the goodness of the work done and the excellence of the FORCE. How many advanced divers do you know spend ages and countless amounts of money to find the perfect pair of carbon fiber fins? There’s no one size fits all for anyone diver and the countless set of conditions you’ll be diving. The most important aspect of a perfect freediving fin is the foot pocket. If that’s not comfortable, no fin, whether plastic, fiberglass, or carbon fiber will matter. Truth be told if you’re a great freediver or spearo and you were great using $150 fins when you upgrade to the $450 fins…they BETTER be great…otherwise why did you spend the money? Are they really great though or do you just think they are great? That’s why if you look on Craigslist or used dive shops sales, you tend to see a bunch of carbon fiber fins for sale…often cheap! For performance, it all comes down to what you need to get yourself in the best position at the right time to spear a fish. Do you tend to dive 15 feet, 70 feet…triple digits? You’re best off with a comfortable set of fins you’re used to. Find a decent pair that you like, then buy a spare. Keep one for your regular diving needs and have a beater pair for when you launch off the rocks or kick them around the reef looking for lobsters. If you have the cash, get a third pair for the boat diving and deeper dives. 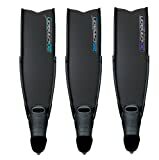 All for cheaper than one set of the top of the line carbon fiber fins! Carbons fins aren’t all bad and I shouldn’t be bashing them to this extent. They are lighter than fiberglass and plastic fins, they do cut through the water better, they are breakable…but so are plastics if you hit them hard enough. 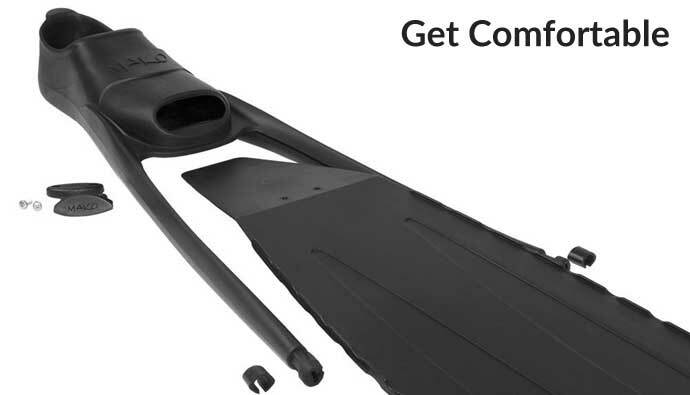 You just won’t instantly become a better spearo by buying a set of high-end fins. The only need for carbon high-end fins are if you’re diving deeper than 80 feet, tend to dive in heavy current areas, or you’re going to catch the BFT, Dogtooth, giant tuna, big billfish, or massive grouper. Scuba Fins: Usually don’t have a full foot pocket and are loose to fit a boot. Snorkeling Fins: Short and stiff fins meant for easy movement on the top of the water. Bodyboarding Fins: Usually a super short stiff fin that’s worn on one or both feet to help the sponger drop in on waves. Body Surfing Fins: Similar to the bodyboarding fins and often the same. Freediving Fins: These are mainly what we are going to cover today. Pure freediving fins help divers reach depths with high efficiency. Spearfishing Fins: Similar to freediving fins, but we are looking to add a bit more robustness for the conditions and stiffness for helping bring in the fish (and your speargun or pole spear, mask, and wetsuit). I hope this article clarified the different options you have for chosing your next set of fins!